The book will be an open learning / distance learning text in the Analytical Techniques for the Sciences (AnTS) covering analytical techniques used in forensic science. No prior knowledge of the analytical techniques will be required by the reader. An introductory chapter will provide an overview of the science of the materials used as forensic evidence. 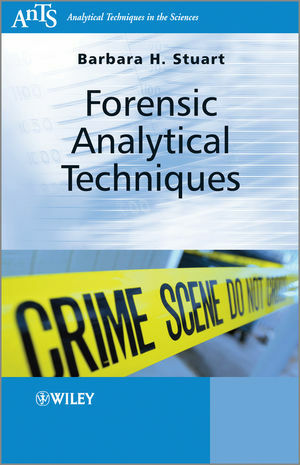 Each of the following chapters will describe the techniques used in forensic analysis. The theory, instrumentation and sampling techniques will be explained and examples of the application of each technique to particular forensic samples will be provided. The reader will be able to assess their understanding with the use of regular self assessment questions and discussion questions throughout the book. The user of the book will be able to apply their understanding to the application of specific techniques to particular analyses encountered in their professional life. After graduating with a BSc degree from the University of Sydney in Australia, Barbara Stuart worked as a tutor at this university. She also carried out research in the field of biophysical chemistry in the Department of Physical Chemistry and graduated with a MSc in 1990. The author moved to the UK to carry out doctoral studies in polymer engineering within the Department of Chemical Engineering and Chemical Technology at Imperial College (University of London). After obtaining her PhD in 1993, she took up a position as Lecturer in Physical Chemistry at the University of Greenwich in London. Barbara joined the staff at the University of Technology, Sydney, Australia in 1995, where she is currently a Senior Lecturer in the Department of Chemistry, Materials and Forensic Science. She is presently conducting research in the fields of polymer spectroscopy, materials conservation and forensic science. Barbara is the author of four books published by Wiley, "Modern Infrared Spectroscopy", "Biological Applications of Infrared Spectroscopy", "Polymer Analysis" and "Infrared Spectroscopy: Fundamentals and Applications" in the current ANTS series of texts and "Analytical Techniques in Materials Conservation".